Newspaper clipping. Date and source of originating document unknown. See source link. With 37 consecutive years’ service to his credit, Sgt. G.A. Graham of this town is the oldest serving soldier of this district. 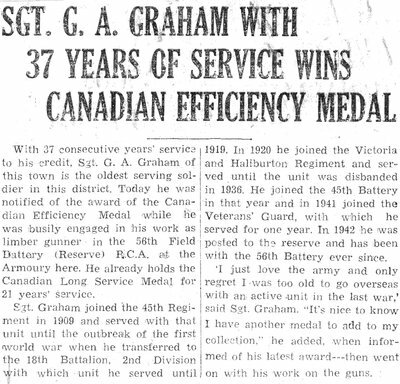 Today he was notified of the award of the Canadian Efficiency Medal while he was busily engaged in his work as limber gunner in the 56th Field Battery (Reserve) R.C.A. at the Armoury here. He already holds the Canadian Long Service Medal for 21 years’ service. Sgt. Graham joined the 45th Regiment in 1909 and served with that unit until the outbreak of the first world war when he transferred to the 18th Battalion, 2nd Division with which unit he served until 1919. In 1920 he joined the Victoria and Haliburton Regiment until the unit was disbanded in 1936. He joined the 45th Battery in that year. In 1942 he was posted to the reserve and has been with the 56th Battery since. “I just love the army and only regret that I was too old to go overseas with an active unit in the last war,” said Sergeant Graham. “It is nice to know I have another medal to add to my collection,” he added, when informed of his latest award — then went on with his work on the guns.